It was thrilling tonight to see Olympic Figure Skating silver medalist Sasha Cohen give it a shot for the 2010 Vancouver Olympic Team. It would have really been something for her to be a three-peat Olympian after skating at Salt Lake in 2002 and Torino in 2006. Watching Cohen skate this evening -- during the AT&T 2010 U.S. 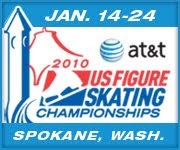 Figure Skating Championships in Spokane, Wash. -- brought back memories of last March, when Cohen was skating on tour in Atlanta and she took time for a blogger interview rink side at Philips Arena (was it really only 10 months ago when it was uncertain whether she'd be competitively skating now?). Sorry to see Cohen won't be in Vancouver for the 2010 Winter Olympic figure skating as a returning Olympian, but I have a feeling she'll be spotted around town doing paid appearances to adoring fans. Best of luck to the U.S. Figure Skaters who apparently will be coming to Vancouver, including Rachel Flatt and Mirai Nagasu (is it just me, or is it too weird to see another U.S. ladies figure skater, Nagasu, head to a Canada Olympiad with music from "Carmen" in her main routine? Not another Debi Thomas, please -- if Nagasu is to skate to Bizet, she better keep her Witts about her).